Berkeley, CA â€“ 6 December 2011—Reading BULLETPROOF COFFIN is like unearthing a dusty old box of rare single issues from the back of a deceased shut-in’s closet. You find one treasure after another—strange stories never before seen, covers that are so ridiculous they’re unbelievable, and collaborations you never knew existed of favorite creators. This January, writer David Hine and artist Shaky Kane are back at Image Comics with a second miniseries that will evoke that feeling of discovery all over again with BULLETPROOF COFFIN: DISINTERRED. Fans of Alan Moore’s comic series 1963, as well as the films of David Cronenberg and David Lynch, are all likely to be hooked in by this undeniably bizarre, postmodern comic book. 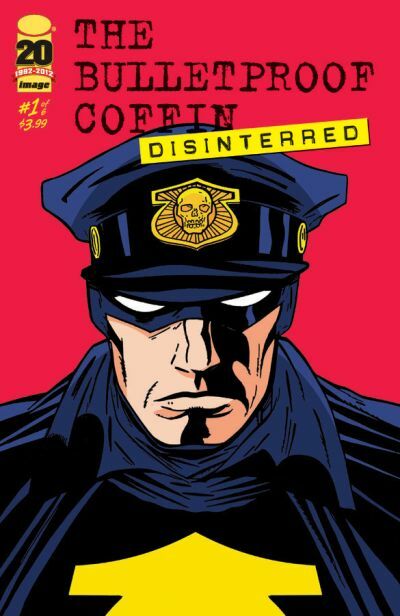 With six stand-alone issues that can be read in any order, Hine and Kane have included plenty of loops and side roads in BULLETPROOF COFFIN: DISINTERRED’s non-linear plot, and invite their readers to make any story connections they want. Though the second series doesn’t follow directly from the close of the first, there are plenty of tantalizing links to THE BULLETPROOF COFFIN, VOL. 1 TP. THE BULLETPROOF COFFIN: DISINTERRED #1 (NOV110363), a 32-page full-color comic book for $3.99, will be on sale in stores and on digital platforms on January 25. THE BULLETPROOF COFFIN, VOL. 1 TP (NOV110364, ISBN: 978-1-60706-368-1), a 200-page full-color trade paperback for $17.99, is on sale now and available for retailers to reorder. To learn more about THE BULLETPROOF COFFIN comic, visit http://waitingfortrade.blogspot.com/.